Soft vs Hard Pillows, Which is Better? » Soft vs Hard Pillows, Which is Better? Some people have trouble getting enough sleep or feel un-rested when they wake up. This might be occasional due to a number of different reasons such as daily routines, working different shifts, bedtime habits, etc. but if you have sleepless nights on a regular basis, then there is something wrong which could be as simple as using the wrong type of pillows. or pillow’s fill type, whether soft or hard. Soft or Hard, which one to pick? The choice of a pillow is mainly dependent on comfort and comfort is realized by identifying your favorite sleeping position to be able to select the right pillow type for you. Some of you like to sleep on your sides, some on your backs, and some on your stomachs. To satisfy all these sleep preferences, there are different pillows for all these positions. Generally speaking, if sleeping on your back is your favorite position, then a thinner pillow with medium firmness is your best choice. It actually depends on your body build and height, but the majority of back sleepers need a pillow that supports the natural shape of your upper spine, providing support under your head, neck and shoulders. DIMENSIONS: King size measures 20" x 36"
Sleep experts recommend contour shaped pillows that are designed with a valley for the head and an arch for the neck. These contour pillows are often made from memory foam. If you are a stomach sleeper, though, your best bet would be a very soft, and almost flat pillow, or a pillow that can be adjusted for better comfort by removing the fill. The choice of a thin and soft pillow is to avoid forcing your spine into a very unnatural position while you sleep, which can be caused by sleeping on a high pillow and end up with major back and neck pains. For side sleepers, like myself, then you need a pillow that provides support for both your head and neck like a thicker, firmer pillow. This type of pillows are designed to keep your neck and spine perfectly aligned, and as a result, you sleep more comfortably and wake up feeling refreshed. A softer pillow will cause the head to slide back and put pressure on the neck. Some of us might not have one specific sleeping position but tend to sleep in all or some of the above ones. In such case, the best option for you would be an all-around type pillow. This is basically a not too dense or high pillow which provided the right support in all sleep positions. The bottom line is that choosing the right pillow, be it soft or hard, thick or thin, really depends on the position you feel most comfortable sleeping in. Matching your sleeping style to the right pillow is a big step in getting healthy and comfortable sleep on a regular basis. As we’ve already established, picking the right pillow based on sleep preferences and habits is one step ahead in ensuring quality and comfortable sleep; however, you should also consider which materials you’d prefer you pillow to be filled with. Although they might all look alike, there are many types of fillings found inside pillows which are broadly classified into natural and synthetic filling materials. Each of these pillow types has their pros and cons, and picking the right one really depends on personal tastes. Let’s explore some of these pillow fill types and how they can each benefit our sleep. Natural pillows include; down fill, feather fill, down with core feather, and Buckwheat. 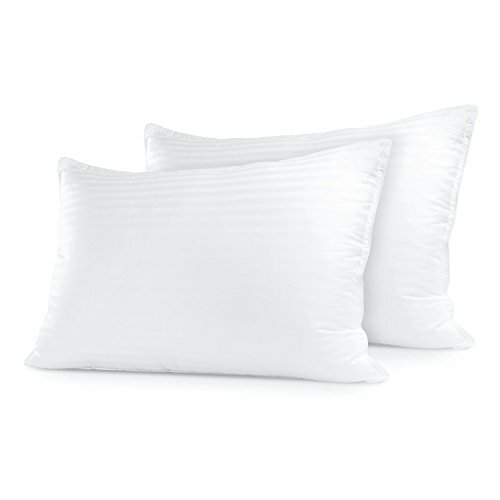 Down fill pillows are filled with duck or goose feathers, and the feather content may be to 10%. This type of pillows offer soft support and are quite suitable for stomach sleepers because they conform to one’s neck and head wonderfully. Feather fill pillows are considered the best choice for side sleepers and also those who prefer to sleep on their backs. This type of pillows offers medium to firm support. They contain 10% down content and are filled with duck or goose feathers. Buckwheat pillows offer firm support. They are great because they allow for natural air circulation hence comfortable temperatures for enhanced sleep. Solid core, which provides a bouncy springy solid feel and shredded filling which offers a down feel and does not compact over time. This type of pillows is popular among people who have certain allergies and need their pillows to be hypoallergenic, anti- microbial, and resistant to dust mite. Memory foam pillows, which are very popular, provide the best neck support since after sleep they revert back to the original shape. They are a popular choice for many people because they reduce pressure points. We all know how a good night’s sleep can affect the quality of our life, therefore, we should all remember to pick the pillow that fits our sleeping habit. Figuring out the most comfortable sleep position is key to picking the pillow that provides head and neck support and perfect alignment for the whole body.